I have an over thirty year track record of success in cutting edge Internet systems and applications, including applied research and development for the US Government and over twenty years working with innovative new technology companies. Expert ability to combine market / financial research with knowledge of technology, trends to develop, and implementation of sound and profitable business strategies. Responsible for design, implementation, and operation of datacenter operations for the past 20 years. Proven ability to provide effective and reliable solutions balancing cost benefit tradeoffs between various hardware and software solutions. In depth hands-on knowledge covering many Internet technologies including routing, security (firewalls, IDS, transparent proxies, etc), VoIP, Electronic Mail, DNS, Network Management systems, Directory Services (including Directory Enabled Services and Applications), Web Services, Instant Messaging, Social Systems Design, etc. Established Jade Connections as an Internet consulting and services company focusing on delivering system and network solutions. Currently projects include network monitoring (both datacenter and remote), network and host network monitoring solutions and the design and deployment of a scalable and cost effective enterprise class cloud computing infrastructure. Other projects include the design and implementation of highly integrated and scalable collaborative social networking web environments as well as Voice over IP (VoIP) solutions. Jade Connections also provide web and email services for several sites, including Jade Connections, RegainAmerica and others in the region. Network Management is the monitoring of network devices, applications, sensors, and any other equipment or processes that are part of or associated with a network. The Simple Network Management Protocol (SNMP) is commonly used to monitor standard network devices (servers, routers, switches, etc). Embedded processes can be run on servers and workstations to gain access to additional machine and operating system specific data. A Network Management platform is used to collect and record device, process and other data. This data can be interpreted in real-time to produce alerts and automatic actions on behalf of the administrators. Historic data can also be seen and analysis performed so that trends can more easily be identified. Jade Networks uses the Zabbix network management platform to monitor both datacenter assets as well as remote application monitoring. All Jade servers and firewalls are actively monitored around the clock with alerts being sent when potential error conditions are encountered. Jade also provides constant remote network monitoring for MONIC, the Macau Domain Registrar. All DNS, web, and email services are constantly being checked with alerts being sent to both MONIC and Jade staff when problems are detected. I am currently working on a new service offering where we can expand our monitoring capabilities to offer to additional clients. For more information on the Network Management solutions in use on the Jade networks see the Jade Networks Monitoring page. 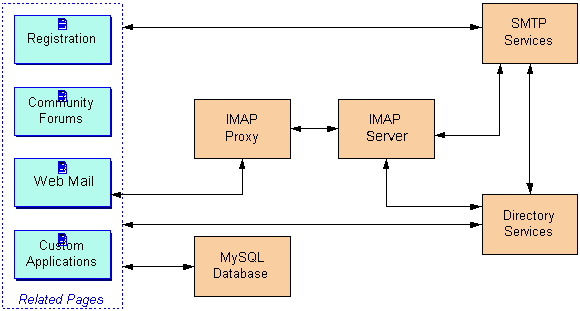 Part of the application integration process involves design for both scalability and performance. The site registration was fully automated, with email account generation and access (via web, pop3, and IMAP) being automatically configured through the Jade Directory Services. Integrated applications included email, chat rooms, forums, distribution lists, games, a basic meeting point, and a placeholder for an online store. The site was taken down in 2011 with its future status still under consideration. Jade Connections wil be a one stop VoIP solutions provider, providing VoIP PABX Provisioning, Migration Planning and Audit, and VoIP Equipment Sales. Jade Connections will provide services directly to customers in the Asia/Pacific region. Services include business grade VoIP to PSTN termination, support for SIP and IAX softphones, QoS, Customized Billing, and DDI/DID (Direct Inward Dial) landline provisioning and interconnect. If your company is looking to connect existing operations to VoIP, Jade Networks can help by evaluating your current infrastructure. from equipment to existing telecommunication circuits, as well as providing a smooth migration plan to VoIP. Through its sister company, Jade Connections, Jade Networks provides ATAs, VoIP phones, and VoIP PABX systems. We can supply small quantities as well as large OEM quantites. Custom programming of ATAs is available on some models. Jade Networks provides a fully scalable business grade email service, running out of our Hong Kong data center. All standard email protocols are supported, including SMTP/ESTMP, POP3, and IMAP, both on commonly used as well as alternate ports (for navigating through restrictive ISPs). All outbound email is bound by the Jade Networks antispam policies, and all SMTP server access is restricted using SMTP AUTH. Inbound email is scanned for spam and viruses using several countermeasures, including greylisting, ClamAV, SpamAssassin, several distributed spam databases, and others. Private label (domain) mailing lists are provided using Mailman. Email authentication can, as an option, be done through our Lightweight Directory Access Protocol (LDAP) Directory Services, enabling integrated authentication between email services and web applications.